Check here regularly for all the latest news about Wildlife SOS (we also encourage you to follow us on Twitter and ‘like’ our page on Facebook so you hear about news as-it-happens). If you look carefully at the above photo of two Pied Oyster Catchers you can see that the closest one has a plastic flag on its left leg. The lettering L5 can be clearly seen. 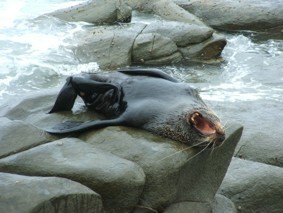 The photo was taken by Mick Wattus, on Lighthouse Beach, Port Macquarie, NSW, on 22nd April 2011. On checking with the Australasian Bat and Bird Banding Society (ABBBS), I found that this bird had been flagged on the left leg, and metal banded on the right by Dr. Greg Clancy, as a runner, at Brunswick Heads Nature Reserve, NSW, on 16th November 2009. 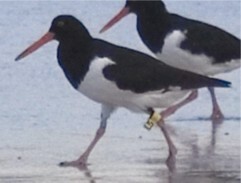 This kind of sighting is called ‘Alive in the Wild’, and the clearly read flag means that the bird doesn’t need to be ‘in the hand’ (which usually means deceased), to track it’s history. So to be aware, download and read the ABBBS’s pamphlet, and get out there looking! Once again the Clarence Valley has been visited by some remarkable wildlife. About 60 Brolgas (Grus rubicunda) have taken up residence in the Lawrence area as part of their nomadic response to seasonal rain. These graceful birds are one of our larger species of bird; with a wing span over 2 metres. The large outspread wings feature in the spectacular courtship rituals for which these birds are renowned. These elaborate rituals of the Brolga are important to indigenous culture. An Aboriginal legend tells of a beautiful young woman who loved to dance. She was turned into a tall, slender bird. The intricate brolga dance is replicated in some of the Aboriginal dances. The Brolga is a grey crane with a distinct red head and a dark dewlap under the chin – characteristics which can be seen in the above photo. The legs are dark grey and extend behind the tail when the bird is in flight. The males and females are similar in appearance. Brolgas generally live in flocks on large open wetlands, grassy plains, coastal mudflats and irrigated croplands, where they feed on vegetable matter such as tubers, grains and grasses, as well as some insects and small animals. Brolgas form island nests, which may protect them from some feral predators such as foxes and cats. Our wetlands provide critical habitat for many migratory or nomadic species that visit the Clarence Valley, and is one of the primary reasons why these areas should be preserved. Indeed, protection of the natural wetland system, including both temporary and permanent inundation of freshwater, intertidal and estuarine areas is important for most of our wildlife. 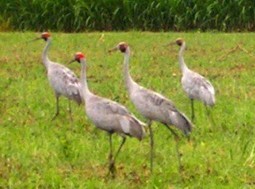 As well as dependence on limited wetlands, the Brolga faces several challenges for which it has poor recovery potential. Their population and range has been significantly reduced since European settlement. Though these birds are widespread in northern Australia they are considered vulnerable in New South Wales. So we are lucky to see this number visiting and lucky to have the wetlands to support them. Recently members of Wildlife SOS attended a workshop on marine mammal strandings held at the Australian Seabird Rescue Centre in Ballina. This was a very interesting practical session which also prompted us to consider the perils facing the whales and dolphins which frequent our coast. Whilst group strandings may be considered a natural, albeit little understood occurrence, single marine mammals stranded on the beach are increasingly the result of human behaviour. The threat we pose to marine mammals comes from vessel disturbance or collision; entanglement in ropes, nets & buoys; polluted waters; and loss of food supply. It is time for serious thought on how these local threats can be eliminated. We have also recently attended a very pleasant evening with members of South Grafton Rotary, during which we presented a wildlife talk on flying-foxes. It was wonderful to see the interest taken in these animals, and to know that people enjoy learning more about them. We have several more wildlife presentations planned for the future focusing, in particular, on the threatened species in the Clarence Valley such as the coastal emu. These presentations will be composed specifically for different audiences including schools, community organisations and environment groups. Please contact Jennie here for more information. In September 1994, the death of Vic Rail and his race horses alerted us to the emergence of a new virus, called firstly equine morbillivirus, then Hendra, after the suburb where it was first identified. Despite its regular occurrence since that time, it is considered to be rare, and not easily transferred. Morbillivirus are not new to us – measles among people, and distemper among dogs are two examples that have been around for a long time, and both are now successfully managed with vaccination. Tests have indicated that Hendra is found in the natural world in flying foxes, but experiments have not yet shown if, or how it moves across species to horses, and then from horses to people. 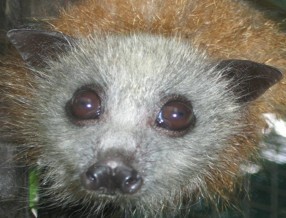 Wildlife carers with many years of intimate contact with flying foxes have shown no sign of antibodies that would indicate that the virus moves between people and bats. At this stage, where it comes from, and how it is transmitted seems less important than working out how to manage it when it presents in horses. Until a vaccine is available, and Biosecurity Queensland places that about 1 year away, risk management seems to be the best way to prevent outbreaks of Hendra. To minimise chances of horses contracting the virus, the Australian Veterinary Association recommends that all horse feed and water containers be covered, and that horses be stabled at night, or kept in areas where they are not exposed to night-feeding flying foxes. To minimise risk to people, they recommend that good hygiene, like hand washing, and avoiding coming into contact with horse saliva, will lessen contact with possible viral fluids. The Biosecurity Queensland web site has regular updates, and can be followed on Facebook and Twitter. 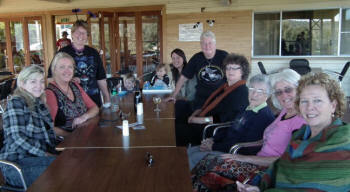 On Friday 13th May 2011, local members of Wildlife SOS (pictured ) met for lunch at the Rest Point Hotel, in Copmanhurst (near Grafton, NSW). The meeting location was chosen due to a recent article published in The Daily Examiner outlining the proprietors’ tolerant, ‘live-and-let-live’ attitude towards the adjacent flying fox roost. Wildlife SOS wanted to show their support for this refreshing stance. in all directions. The animals were in mating phase, and their excited ‘twitterings’ could be heard. Members also observed various bird species, including a group of seasonal currawongs, and were delighted to enjoy a delicious meal while observing some of our precious native wildlife in action. Wildlife SOS members highly recommend the unique experience of enjoying a meal AND wildlife-watching on the deck of the Rest Point Hotel, Copmanhurst! From the hinterland through to the beaches, the Clarence Valley is renowned for its natural beauty. It is an environment that provides us with a charming lifestyle. It is an environment that is admired, and often times envied, by visitors. It is home to a diverse range of native animals. It is vital that we care for what we have, and don’t risk losing it, as has happened in other places. Throughout the world, areas that were once pristine are now overwhelmed by the rubbish in their environment – debris litters the roads and waterways; insidious chemicals hide in the soil and water. We must ensure that does not happen here. 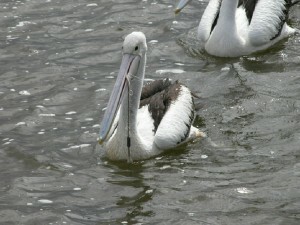 We must ensure that we do not see a re-occurrence of the tragic plight of this pelican on the Clarence River. Be mindful of your rubbish: don’t leave it behind when you are out and don’t let it escape in the wind. Don’t let chemicals get into gutters and drains – these all discharge into our waterways. Prevention is also better than cure – support programs such as the Yamba Chamber of Commerce project to eliminate plastic bags. Do what you can to keep our environment clean – it is goodfor us and good for the wildlife. The use of helium balloons has become common at festive occasions and promotional events. The balloons are colourful, fun and carry messages. Unfortunately, these balloons that rise so gracefully into the sky come back down as litter. What is very scary is where these balloons come down, and the problems they pose for wildlife. What is very scary is where these balloons come down, and the problems they pose for wildlife. Large numbers of balloons are being found on our local beaches on a regular basis. The balloons in this photo were collected from one beach, in just one hour. Some balloons printed with advertising logos have been found to have originated several hundred kilometres away. Some people think that the balloons burst into tiny pieces when they rise high into the atmosphere. This is not the case. These balloons that are washing up on our beaches are not tiny pieces – some are still partially inflated. Most have their ribbons still attached. Helium balloons drift long distances with the prevailing wind. When they fall into the sea they travel on the current. Marine wildlife feed on items that float in the sea. Sadly that can include plastic rubbish that cannot be digested. Dead turtles, shorebirds and dolphins have been found with plastic in their gut. Use balloons filled with air, not helium. Air-filled balloons do not escape so readily. If you must use helium balloons make sure they are anchored very securely so they don’t fly away. After you have finished with the balloons throw them in the rubbish bin. Think of other ways to display your message. Helium balloons may carry a death sentence for some of our native animals – and that is not a good message.